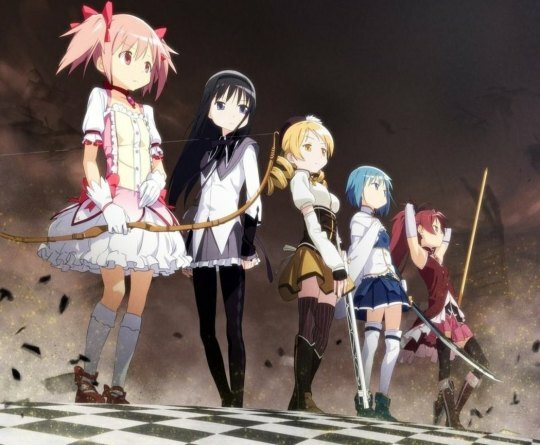 The other day I mentioned on Twitter that I was feeling the itch to watch some new anime, and when I mentioned this to my wife, she recommended (again) that I watch Puella Magi Madoka Magica (Mahou Shoujo Madoka Magika). My wife doesn’t really watch much anime, especially new stuff, but this was a series that she watched about a year ago, and I remember that at the time she tried to convince me to watch it, but I still didn’t make the plunge. On the surface, this absolutely looks like the type of anime series that I despise (moe, otaku-focused), and that’s currently taking over the anime space these days. But I made the plunge, and I’m glad I did, watching all 12 episodes over the course of a day (there are also 3 follow-up movies, that I plan on watching as well). The easiest way to describe this series is that it does to the magical girls genre what Evangelion did to the mech genre. The fact that not only is it a genre that I don’t like (whereas I like even basic mech stuff), it’s also an aesthetic that I really don’t enjoy watching, but if you can persevere – and I’d say it’s a really slow burn, with things only starting to reveal themselves around episode 3 or 4 – you’ll find something that’s quite interesting and rewarding to watch. It’s best that I don’t go into the details much – in fact, when the series first launched, they made it seem like it was just your regular magical girls show, which shocked viewers as the story progressed – but I’ll just say that it’s a much darker show than what a first glance (and even the first episodes) would suggest.